Even though crème brulee is one of my favorite desserts, this was not the reason that triggered the molecular gastronomy exploration based on this classic dessert. It was the quail egg yolk with a caramelized outer shell made by my chef friend Flavio that inspired me to search for a molecular gastronomy sphere to which I could apply the caramelization technique of the egg yolk dish. The obvious answer was a liquid crème brulee sphere using the Reverse Spherification technique. you can still carefully melt some sugar on top with a torch. Start by preparing the alginate bath. Mix the sodium alginate in the water using an immersion blender until the sodium alginate is completely dissolved. If this is your first time doing this, be aware that this may take longer than expected. Let it rest for 24 hours in the fridge so that the air that has entered the mixture disappears and the sodium alginate is completely rehydrated. Heat heavy cream with vanilla extract in low heat until it starts to boil. While you wait for the cream to boil, whisk the egg yolks with the sugar in a bowl on simmering water until the mixture turns from yellow to pale yellow and becomes thicker. Remove the bowl from the simmering water and start adding very slowly the heated cream while you continue whisking. Then cool it placing the bowl in ice cold water and when cold to the touch, pass the mixture through a fine sieve. Dilute the calcium lactate gluconate in the crème brulee mix. Depending on several factors, the crème brulee mix could have slightly different consistencies in each preparation. Check the viscosity of the crème brulee mix before adding all the xanthan. You may want to test it first in the alginate bath and if it spreads on the top of the bath it needs to be more viscous and more xanthan should be added. Mix the necessary xanthan with a hand blender. Let it rest in the fridge for a few hours. 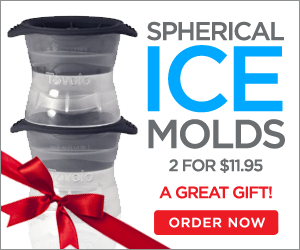 You are now ready to start the spherification process! Remove the alginate bath from the fridge. 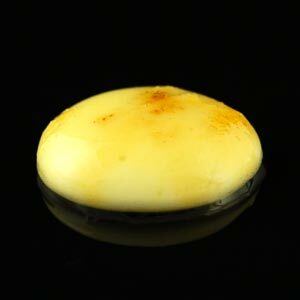 Scoop the crème brulee mixture with a half sphere 5ml measure spoon and carefully pour it into the alginate bath. It is important that the crème brulee spheres don’t touch since they would stick together. Leave the spheres "cooking" for about 2 minutes in the alginate bath and then carefully remove them using a slotted spoon. Then rinse them very gently with water and strain them carefully. If desired they could be stored in a sealed container with water in the fridge. To improve the technique read 10 Tips to Create a Perfect Sphere. - Melt some sugar on top with a torch without overheating the sphere. You’ll have to serve immediately after this. - Serve in appetizer spoon on a slice of fresh strawberry or fig.